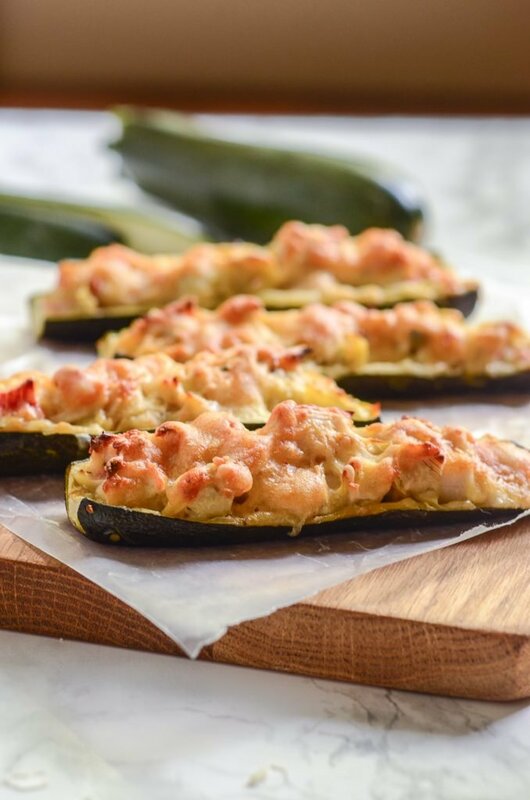 These Crab and Artichoke Stuffed Zucchini make for an extremely versatile appetizer; just fancy enough to be great for a baby or bridal shower, but approachable and cheesy enough for tailgating! This post was updated on 10.19.2017 with new photos and content. Some days you just want to curl up and eat your favorite appetizer for dinner. These Crab and Artichoke Stuffed Zucchini are (thankfully) one of those recipes that you don’t feel bad doing that with. Packed with cheese, crab, and artichokes and leaning heavily on greek yogurt instead of mayonnaise makes it a (mostly) guilt-free indulgence. Homemade Mayonnaise in 2 Minutes. This recipe only uses 1/4 cup of mayonnaise, but if you make it at home, you’ll get a much more flavorful and tangy filling. 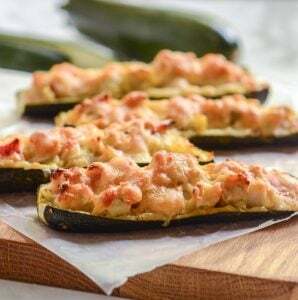 If you have any of this Crab and Artichoke Stuffed Zucchini leftover at the end of your event, it will keep in the refrigerator for up to three days in an airtight container. Make sure to let your stuffed zucchinis completely cool before storing because zucchini usually develops condensation in the refrigerator. Offset this by lining the bottom of your storage container with paper towels (and maybe throw one on top for good measure). Gently wipe down each zucchini and place it on a parchment paper lined sheet pan. Sprinkle some fresh cheese on top of each zucchini. Bake for 20-30 minutes or until the Crab and Artichoke Stuffed Zucchini are heated through and the new cheese is melted. Depending on how sturdy your zucchini were originally will impact how floppy they are with reheating. Keep in mind that it may no longer be a finger food, but rather something you need a fork and knife to eat. If you want, this recipe can easily become a dip instead of stuffed zucchini. Just fill an oven safe container with the filling and bake for 30-45 minutes or until hot throughout. If you use a tall container it will take longer to heat up than a wide container. Serve it with zucchini, assorted fresh veggies, toasted pita chips, or fresh crusty bread. Also, don’t let the different kinds of cheese overwhelm you. Most Italian blends (my favorite it the Quattro Formaggio Blend from Trader Joes) will achieve the same result. 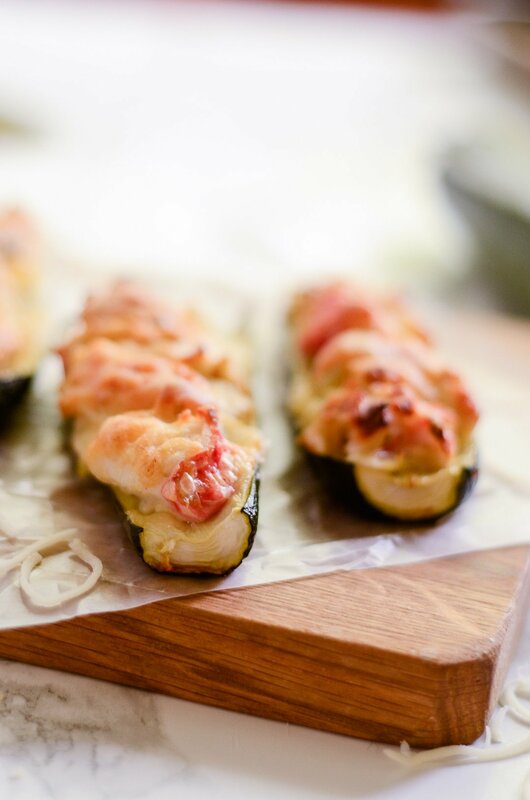 Get your free printable grocery list for this Crab and Artichoke Stuffed Zucchini recipe HERE. This grocery list has everything you’ll need to make this Crab and Artichoke Stuffed Zucchini recipe. To help in making grocery shopping simple, each ingredient is listed in easy-to-find grocery store amounts. If there is no amount specified, that means that you can buy the smallest (or largest) container available and still have plenty left over. A combination of all the flavors that are good in this world, this crab & artichoke dip is a delicious cheesy blend of things that make you want to cuddle on the beach. In a bowl, combine all of the crab and artichoke filling (dip) ingredients and set aside. In a different bowl, combine the topping ingredients and set aside. Using a small spoon, scrape out the seeds of the zucchini until it has a hollow cavity. Make sure to hold the sides of the zucchini firmly so it doesn't rip into pieces while you're scraping. 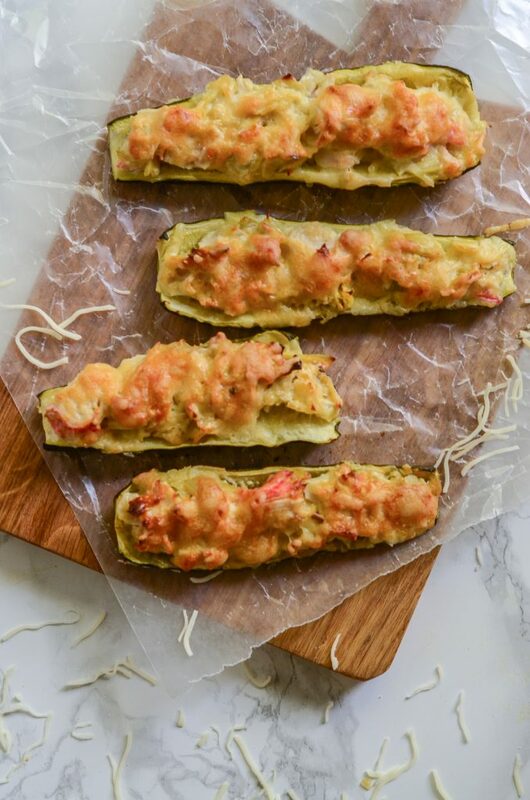 Fill each hollowed out zucchini to slightly overflowing and sprinkle with a generous amount of cheesy topping. Place on a sheet pan and bake for 30 minutes or until the cheese is bubbling and starting to brown. Remove and serve immediately. If you use imitation crab, for best results, make sure to use one that lists an actual fish (like pollock), not "fish protein". Also, "chunk" style will seem more authentic than flake. *To make this recipe gluten-free, substitute the panko for a gluten-free variety, or just omit it all together. We love zucchini in our home. I’ll have to give these a try! Yes, I could definitely eat the whole batch by myself as well! The greek yogurt gives it that great texture and flavor without being as heavy as mayo! Absolutely beautiful blog! So happy I found you (through Instagram). I’d love to do a collaboration sometime! If you are interested, visit my blog: hagenmhamilton.com or email me at hagenmhamilton@gmail.com. Love your content and can’t wait to peruse the site!